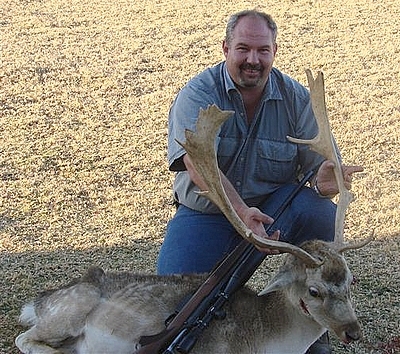 "This old fallow deer had no teeth left in its mouth, so from a distance of 150m the 40gr HV headshot was merciful - although it took me two days to get the perfect shot so as not to lose this extraordinary rack. I have used the 40gr HV's successfully for trophy head shots in my 22-250. It is my favourite bullet for zebra, as the skin is never damaged." 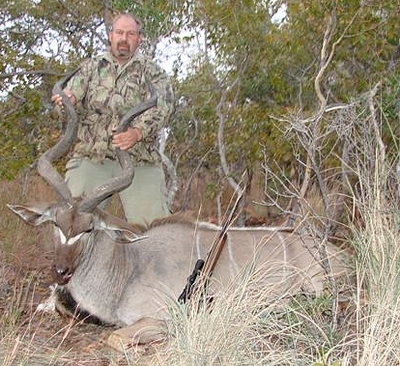 "This kudu bull was taken at 170m with my .416 Remington, using 330gr HV at 2400f/s. He was facing me sideways on against the mountain slope above me. The bullet entered the right shoulder and exited behind the left. After moving forwards for about 30m it ran out of steam. I was quite surprised at the narrow horns measuring 54,25 inches, with a slaughtered weight of 198kg." 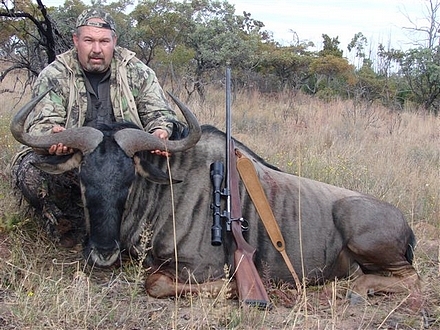 "This animal was shot at a distance of 350m, with virtually no wind. As you know, I am not the smallest of people, so this is what a 32 inch blue wildebeest looks like. I used my .416 Rem. The 330HV projectile perforated the lower section of the chest and heart and broke both his front legs."